I do like this. Sure, it's not that original. But it is very tasteful with great proportions. And it does look more upscale than before. The grille especially looks much more refined than the blunt design they've been using for a while. It is a bit smaller than before. (And about 700 pounds lighter). But can still seat up to 7 people. Now the base engine is a 2.5 Liter. Which, I think, is a terrible idea. I just drove a Chevrolet Equinox (review coming soon) for a week with that same engine. And it was slow!!! I cannot imagine that weak engine in a larger/heavier SUV. Otherwise the 3.6 Liter V6 is still an option. And the only one you'd really want. Is this based on the overseas Trail blazer? No it's not. The overseas TrailBlazer is related to the Colorado Pick Up. This is a different and new platform. Next Enclave/Traverse will be based on this. A design from 2007 and a 2.5L 4 cylinder engine! Where can I rent this? That's a really nice dodge Durango! One of the selling points was it's size. Now it is basically the size of a Hyundai Santa Fe. So it is now smaller than the Pilot and Explorer. @Vince's comment 1/12/16 at 11:03. This is on the C1XX (or "Chi") platform, the same as the Cadillac XT5, which, as you mentioned, will be seen in a stretched form for the next Enclave and Traverse. Love the new exterior. Interior I'm still indifferent to -- not lux enough for a car in this price range. Durango has nothing to worry about here. And Toy/Honda/Hundai/Kia fans will be loyal to their brands no mater what the facts are. So, I agree, not much to show for after all that time & money spent on "improvement". The Grand Cherokee ECOdiesel is still the category winner in my book! Why is the media making such a huge commotion over this vehicle? So it "lost" 700 lbs? Big deal, the old one was a whale. This is the most uninteresting and complacent design that I've seen out of the Detroit show so far. With all the hi-tech stuff being shown, this is just dull. Odd that the Acadia is getting a shorter wheelbase than the Traverse and Enclave.. wonder if that is to avoid direct showroom comparision with the Enclave? Or maybe there will be also be an Acadia XL this time around? 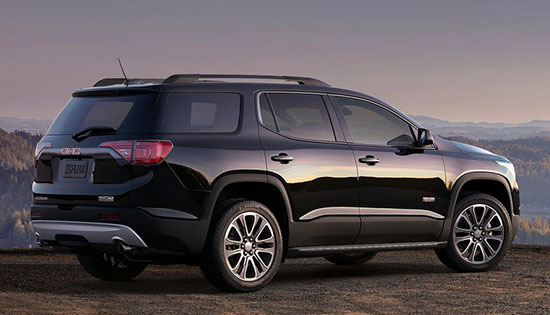 Or perhaps Chevy is only getting the long wheelbase version because they're finally getting the Colorado-based Trailblazer to fill the space between Equinox and Traverse? It's the former. This is being done to avoid the Acadia and Enclave directly competing with each other, particularly since Cadillac is going to have a new large crossover in the coming years as well. Chevy is getting the long wheelbase version in the form of the Traverse, but it will also be getting a new midsize crossover, likely sharing its underpinnings with the Acadia and XT5 on this normal/shorter version of the Chi platform to bridge the gap between the Equinox and the Traverse. The new vehicle will NOT be the truck-based Trailblazer. Is Sergio Marchionne killing Chrysler? Better pictures of the Cadillac CT6?